Most people know that Ruth Reichl was the last editor of Gourmet magazine and that she’s written a number of best-selling books, but have you ever read her first book? “Mmmmmmm: A Feastiary” was published in 1972, and is it ever a treasure. I was really lucky to get my hands on a real live copy of this out of print book. What a find! Her writing is so honest, sassy, sensual, funny, earthy and sophisticated, all at the same time. The recipes are practical, straightforward, un-fussy, and full of flexibility and flavor. 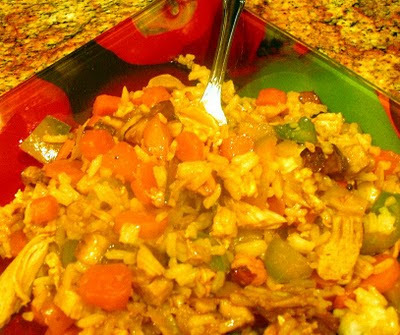 The first recipe I tried was Fried Rice and it wasn’t really a recipe, of course, more a formula, a how-to, as is most of the book. And the recipe was in a chapter of the book called “Fat Food for Lean Times,” full of ideas for stretching food dollars. Here’s how she introduces Fried Rice: “Fried rice is one of my standbys. It is easy, delicious, filling and can be made with just about anything you have in the house.” And that’s exactly what I was doing in one of my “gotta use up what’s left in the fridge” modes. Before the recipe, let me tell you how I got the book: I “borrowed” it from the school library where I was substitute teaching one day. I told the librarian how hard it was to find one of these books – last I checked on Amazon, you could get it for around $80 – and she allowed that I could keep it through the school year. (I didn’t tell her how valuable it was!) I’ve already read it several times, and now I’m really beginning to cook from it. More, soon, in an upcoming installment . . .
Heat pan until very hot. Add 1 tablespoon vegetable oil and a little salt. Heat. Break egg and scramble. Add onion, garlic and other vegetables, except for scallion and tomato, if you’re using them. Add meat. Now add sherry mixture and stir for thirty seconds. Add and stir rice. Cover for 45 seconds. Stir thoroughly. Add soy mixture and, if you’re using, the scallions and tomatoes, and stir again. I was given this book in November 1972 when I was in my second year of university. Little did I know how valuable it would become to me. I have made many of the recipes and a number of them have become my absolute favourites.....jambalaya, rhubarb pie, moussaka...need I say more. Mine is much the worse for wear but the original price is still in the front $7.95. It is a treasure stains and all!